Today I have a photo I found in my mom’s house not in the clean out after she died, but in the clean out in October of 2013, when I took a week off work to help her get her house ready for sale because she’d found a senior living place she said she liked. Yeah, that didn’t work out. She didn’t really want to sell her house. Pretty much all of the boxes I packed up in 2013 to go into storage were still in the garage in 2016 when my brother and I had to start clearing things out. Ah well, water under the bridge now. This photo was taken in May of 1968. I was six years old; my brother was two-and-a-half. 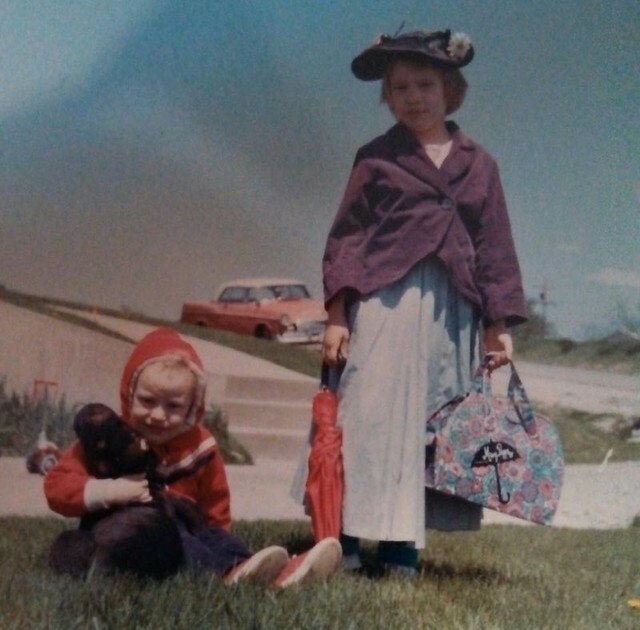 He’s holding his stuffed dog; I’m decked out in my Mary Poppins costume, which my mom made for me (excepting the umbrella and carpet bag). We’re standing in the yard of our house in Illinois, with my dad’s car in the background. Our parents were still married, so we were all living there at that point. (My dad continued to live there until the day he died in 2000, while the rest of us moved out and on.) We don’t look happy; it’s tempted to say we were reflecting the tensions between our parents, but it could just be we were annoyed at having to stop playing to pose for photos.